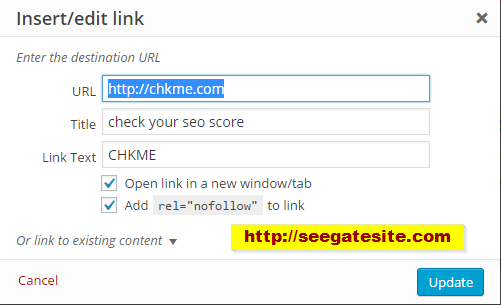 Programming Tutorials – seegatesite will share tutorial how to easily add title and nofollow rel on links using a wordpress plugin. Title and nofollow rel attribute is useful for improving onpage seo. Plugin title and nofollow for links help us in adding nofollow rel and title attribute on a link and speed us in creating article. Google announced that the URL containing the attribute rel = “nofollow” will have no effect on the PageRank of the link target. In other words, this attribute signaled to Googlebot not to crawl links that are referred by a web page. This step was followed by several other search engines. However, each search engine has a different interpretation of the rel = “nofollow”, the effect is varied, and thus has a good destination for a onpage seo web. The difference is that if the DoFollow link, the Google Bot will also follow where the direction of the link and crawl it, whereas if the links are nofollow, the Google bot will not follow where the direction of the link, ignore it and will not crawl it. As I mentioned previously, the addition of this title is one of the SEO on page optimization to make the link becomes more SEO, if any link is not added a title, it will show an error when you check your blog in CHKME. Plugin Title and Nofollow For Links created by Flector, The featured od this plugin is adds a title and nofollow rel checkbox to the insert link popup box.